TREAT your brain to a great night out, and take it to Copenhagen. It will thank you. 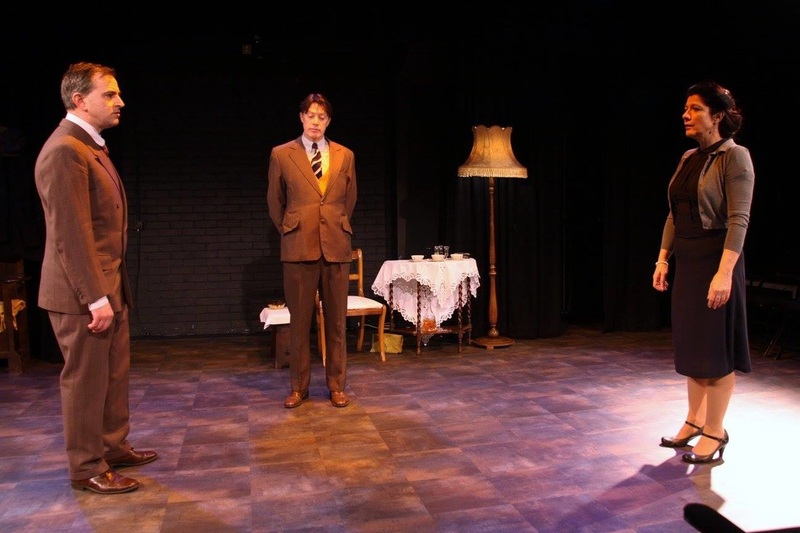 Southend Shakespeare Company's production of Michael Frayn's 1998 play – one of the most lauded of modern times - is an extraordinary achievement for all involved. It poses a massive, indeed cosmic, challenge to its actors. Audiences, too, need to do some mental work. Mamma Mia! this isn't. But it is worth the effort. It is a long time since I emerged from a home-grown production on such a high. Copenhagen tackles the biggest subject imaginable – nuclear annihilation. It centres on what seems like, at first sight, a relatively trivial incident in 1941, at a time when Nazi Germany seemed to be winning the war and overwhelming the world. German nuclear scientist, Werner Heisenberg, a 1932 Nobel prize winner, paid a visit to his mentor, Niels Bohr.. The purpose of the visit, like a lot of other matters, is unclear in his own mind. But the stakes are immeasurably high, since Heisenberg may have it in his power to give Hitler the atom bomb. Decades later, after both men have died, the two scientists, now in some vaguely defined spirit world, converse heatedly about that visit. They are joined by Bohr's wife and soulmate, Margrethe, who has a deep insight into the moral arguments and the human heart, if not the nuclear physics. At the heart of their dispute is the irony that moralistic Bohr, frequently described as “a good man”, worked on the Hiroshima and Nagasaki bomb. Bohr incinerated thousands of innocent people, while Heisenberg, working for the Nazis, had no blood on his hands whatever. Some of the dialogue is very abstruse, but the core theme of the play is clear as clear can be. The playwright – best known for the farce Noises Off (also brilliant, in a different way) – is highlighting the human side of Armageddon. The two scientists possess amazing brains which, as Margrethe puts it, “can think their way into the atom”. Yet they are also human beings. They are subject to exactly the same frailties, follies and uncertainties as any other individual. As Frayn writes: “Mathematics becomes very odd when applied to people. One plus one can add up to so many different sums.” Of course, human weakness really matters when you are dealing with a device that could easily wipe out humanity. Much of the discussion about nuclear physics was above my head, but it did not matter. The power of the drama, the performances, Michael Frayn's words, and the universal issues involved, provide all the stimulus that any audience could ask for. There is another good reason for seeing this production, The three roles challenge their actors like few other parts in modern theatre, not least in the demand to keep an audience engaged. 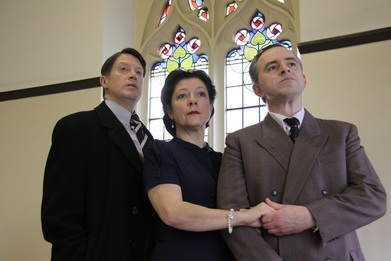 Andrew Sugden and Jeremy Batersby as Bohr and Heisenberg, and Sharon Williams as Magrethe, are simply fantastic in the way they grasp the complex dialogue and bring it to explosive, indeed thermo-nuclear, life. Director Amanda Whiteford stages the production with a minimum of gimmicks, allowing the three actors to shine individually, while also working as a trio. If any one of them fails to get an award for their achievement, there is no justice. Congratulations, too, to Southend Shakespeare Company for having the courage to stage a play that is not an obvious crowd-pleaser, but which certainly pleased the opening night crowd.